I read Sense and Sensibility again. For what is probably the 999th time, give or take a few hundred. I love Jane Austen. I feel like I have to clarify things here. I have loved Jane Austen since before loving Jane Austen was cool. Since before all the movies, merchandise, and fan fiction. Sometimes I feel like the whole world has come along and taken over something I really love. It is a crazy way to think, I know that, but still...I loved Jane Austen before loving her was cool. Though I am pretty sure saying "cool" is not cool and I am showing my age. Anyway, when I was reading Sense and Sensibility again I thought about how timeless Austen is. So many books written a few hundred years ago never let you forget you are reading an old novel. 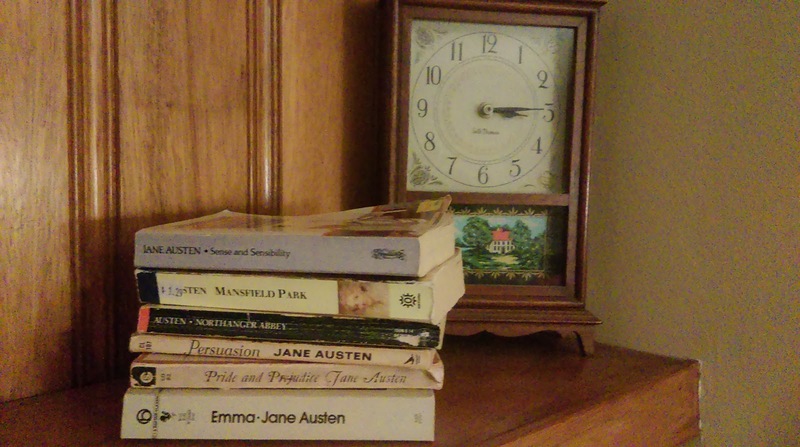 When I read Jane Austen's books time doesn't really matter. The story is just as true today as it was when it was written. It is just as heart-wrenching and just as witty. It is impossible not to feel for Marianne in her conviction that her opinions are set and will never alter. Who does not remember their opinionated teenage years? Your heart aches for the realities of life ahead for her but you can't help smiling because it is all so familiar. I laughed at the line where Marianne says that "a woman of seven and twenty...can never hope to feel or inspire affection again." Didn't we all once think life was over at 18? And I loved the description of Willoughby departing "to make himself still more interesting, in the midst of a heavy rain." Frequently it is the little lines I really enjoy. The few words of a description or the words that show you the feelings of a character. Jane Austen is a master at using those few words to accomplish much. I know I am not saying anything new about Sense and Sensibility, but I just love reading it. And then I want to talk about it.